Sometimes you might require a little help from technology to get a job done properly. It can definitely be hard to give in to some of the technological advances of the day at first, but many of them are more than worth the trouble. A blind-spot monitor is a great example of a piece of technology that you will want to become familiar with as soon as possible. It is great because it alerts the user when there is another vehicle in their blind spot while driving. That can help them avoid some of the most dangerous aspects of driving altogether. You have to hand it to the automakers when it comes to this particular innovation. They did great work to bring this kind of thing to the public and let them take advantage of it. There is almost no question that this has helped to save lives in the long run. 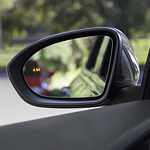 Find a vehicle equipped with blind spot monitoring technology at our dealership!